This article appeared on the North Africa Post on March 24, 2013. Western Sahara was front and center in CNN’s latest edition of Amanpour, marking a rare instance in which the oft-overlooked and stalemated conflict has been treated as more than a peripheral issue in the Western media. Amanpour hosted and plugged a new documentary film on the Western Sahara that claims to shed light on the Moroccan occupation of the territory and abuses of human rights. The documentary, “Sons of the Clouds: The Last Colony" probably wouldn’t have caught anyone’s attention, including a high-level congressional viewing, if it were not the project of Hollywood A-list and Oscar-winning actor Javier Bardem. Though he is most well-known for his love stories of “Vicky, Christina, Barcelona,” and villainous roles in “No Country for Old Men,” and in the latest James Bond “Skyfall”, the Spanish actor has been an active and staunch advocate for the POLISARIO and the right of the Sahrawis for self-determination. Morocco’s litany of violations of human rights and individual liberties in and outside the Western Sahara are indeed indefensible. However, Bardem’s portrayal of the conflict is one-dimensional in its focus on human rights, and myopic in its scope. 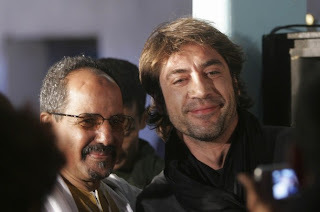 By facilely linking the issue of self-determination to human rights violations, Bardem deemphasizes Morocco's historical ties to the territory and presents a misleadingly uncomplicated treatment of the issue. The historical past of the Western Sahara is encumbered by of the colonial intrusion of North Africa by [specify by whom/give a little more info or link out to another source], which left its indelible marks on the culture, the people and the politics of the region. . However, the United Nations’ application of self-determination in the Saharan territory has completely ignored the colonial powers’ process of re-drawing the borders of the region, and how that affected the identity of the local population. Self-determination has long been a concept that dominated the discourse on the conflict. In addition to regional rivalry, a solution to the conflict has been premised on/hinged on determining a rightful modicum for identifying who is considered Sahrawi, and therefore eligible to vote in the ever so elusive referendum. Though talks of a referendum have been de-emphasized given Moroccan plans for granting Sahrawi autonomy under Moroccan sovereignty, the quintessential issue, at least in my estimation, is an issue of identity, and how it has been conceptualized and articulated according to the terms of modern self-determination discourse. Indeed, the modern notion of self-determination could grant people in the Western Sahara the opportunity to choose autonomy and sovereignty. However, it does not lay down the parameters of defining such people. A simple theoretical discussion on the evolution of the norm of self-determination leaves us with the contentious question: Who is entitled to take part in deciding the future of the Western Sahara through the UN sponsored referendum? To be sure, even the dizzying number of UN resolutions on the Western Sahara fail to demarcate the contours of Sahrawi identity, yet this identity undergirds the right of self-determination as sine qua non to self-governance. However, such conceptualizations of the Western Sahara reflect the United Nations’ lack of historical knowledge (or perhaps even ambivalent ignorance) of the territory, which could enriched how the complex identity issues at stake for all parties involved are understood. The issue of self-determination, specifically a Wilsonian conception of it, would grant a vote for minorities in the region. However, this is difficult as we try to ascertain legal ties to the land since the territory was not clearly demarcated and many local tribes paid allegiance to different historical powers. It is also disingenuous to isolate said allegiances from the context of the historical Moroccan sharifian State, which exerted a pseudo-control over the territory. In fact, these Sahrawi tribes led an autonomous life and paid allegiance to the central authority of the Makhzen, with each tribe having an internal governance structure. This is not far off from what Morocco is offering today, which is located between paying allegiance to the central power and leading an autonomous lifestyle from within the tribe. The interplay of power within the Makhzen between Bilad al-Makhzen (territories firmly under state control in terms of rule and taxation) and Bilad es-Siba (under nominal authority of the sultan) is often marginalized in discussions by analysts of the conflict, privileging the international community's efforts to force a self-determination referendum. The boundaries of the territory itself are colonial impositions and were drawn with no regard for the existing nomadic tribes that roamed throughout the entire sub-Saharan region. Self-determination of peoples, only in the Western Sahara (as demarcated now) legitimizes colonial structures that were imposed in the first place. In other words, the international community, through the United Nations, is trying to implement the referendum for self-determination in the Western Sahara based on the colonially-imposed demarcations of the region. Morocco opposes this simply because this application of the discourse of self-determination completely denies its historical ties with the region. Morocco's plan for Sahrawi autonomy under Moroccan sovereignty has the U.S., France and Spain's support, but the POLISARIO and its benefactor Algeria have rejected the plan as a mere Moroccan attempt to tighten its de facto control over the territory. The talks between the two parties (some say three parties, including Algeria) to work on confidence-building measures have led nowhere over the last few years. In addition to identity and historical factors, the conflict has regional and international dimensions. The non-interventionary strategies deployed by major international powers in the past as well as the general lack of international urgency on the issue have contributed to prolonging the conflict. Only targeted pressure and active diplomatic engagement from the United States, France, or the European community as a bloc can provide a window of hope in the resolution of the dispute, and provide some much-need relief to the plight of the thousands of Sahrawis in the camps of Tindouf in Algeria. Regional issues have also hindered any successful resolution of the conflict. The nature of inter-Maghrebi politics, especially the rivalry between Morocco and Algeria, have fueled the conflict and exacerbated the situation in the territory. Domestic issues have further fomented this rivalry, namely: the role of the military in Algeria and the state’s hardline strategy vis-à-vis the conflict in the Western Sahara; and in Morocco the intransigency of the government, which is backed by public opinion and staunch mass support for the "Moroccanity" of the Western Sahara and the territorial integrity of Morocco. Bardem, who states he is motivated by human rights concerns in the Western Sahara, treats none of these complex historical and political issues. The Oscar-winning actor does not shed light on the role of Algeria in the conflict. Nor is the Hollywood star concerned about the treatment of the Sahrawis in the camps of Tindouf by their own POLISARIO Front, which the actor visited in 2008. According to a Human Rights Watch report from that same year (2008), many camp refugees are deprived of basic the rights of movement, assembly, and freedom of expression. There are even allegations of slavery inside the camps. For the last 37 years, the Maghreb has been plagued by the conflict in the Western Sahara, which has greatly stalled any prospects of the regional integration and cooperation necessary to address the realities of an increasingly globalized world. As the de facto ruler of the Western Sahara, Morocco has its eye on the long-term benefits of reaching a compromise with Algeria over the Western Sahara, and has provided a serious plan for resolution of the conflict. Alas, Algeria's military and its political obsession with its larger geo-political ambitions in the region have hindered any attempt at a meaningful consideration of the Moroccan plan. The blind rejectionism of anything Moroccan will only lead to maintaining the current status quo largely in favor of Morocco at this point. Any meaningful compromise between Morocco and Algeria is beneficial not only to the two countries, but also to the other three countries in the Maghreb region, as it could be a tremendous step towards full economic, political integration, and building a security regime in the face of mounting terrorist threats in the Sahel region.